So here we are, the Winter fog has lifted, with Spring on the horizon & with a new season, comes new trends. However there are some trends that fail to diminish, yet they evolve with substance as we ingeniously interpret them in new lights. 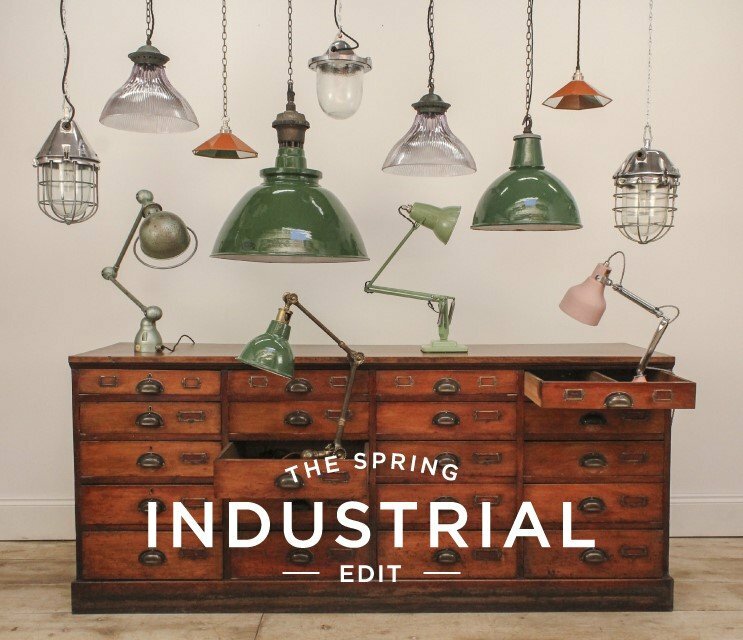 With that in mind, here is our Spring Industrial Edit. 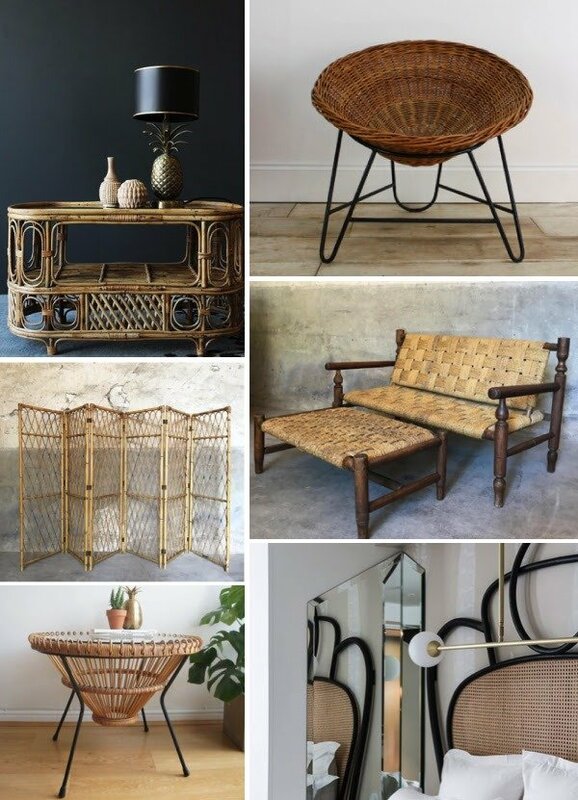 We’ve been working our restorative ‘behinds’ off gathering some renown brands & some totally unique pieces that will not fail to entice you back into this cool & stylish trend with a fresh approach. 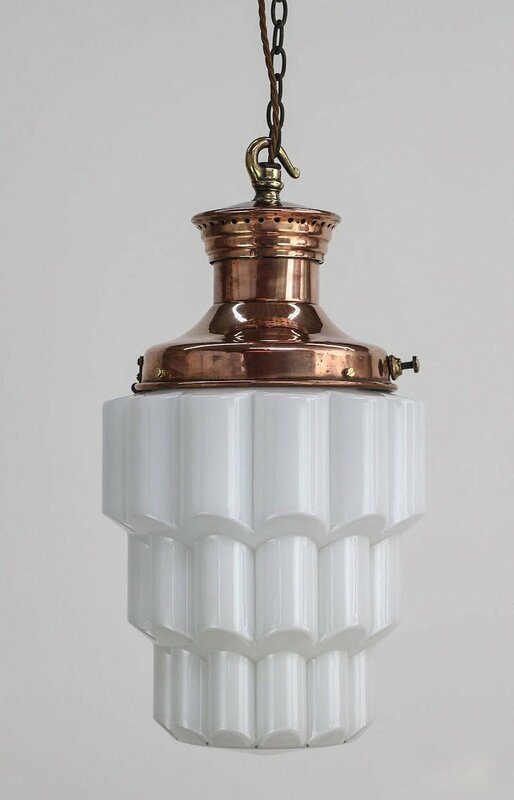 Within this newsletter release we will look to provide you with some feature pieces & demonstrate how to avoid the explosion of mass production & eccentricities. 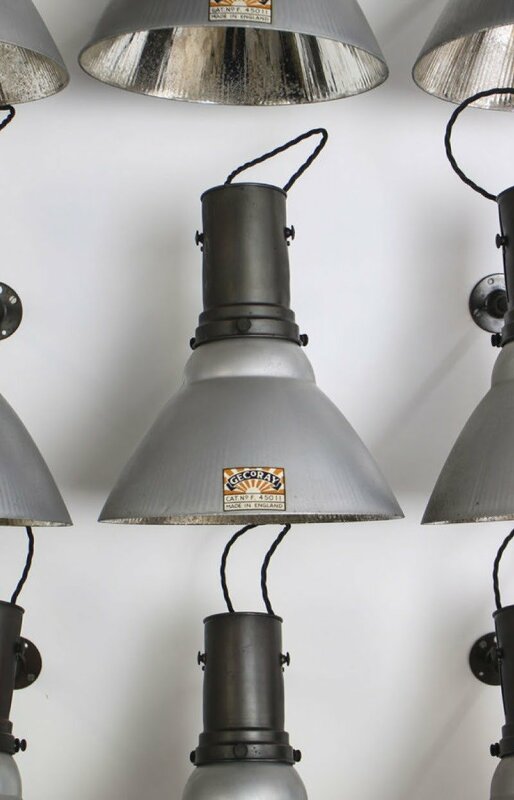 Including some inspiration on how to effectively incorporate original industrials pieces into our current modern day surroundings. 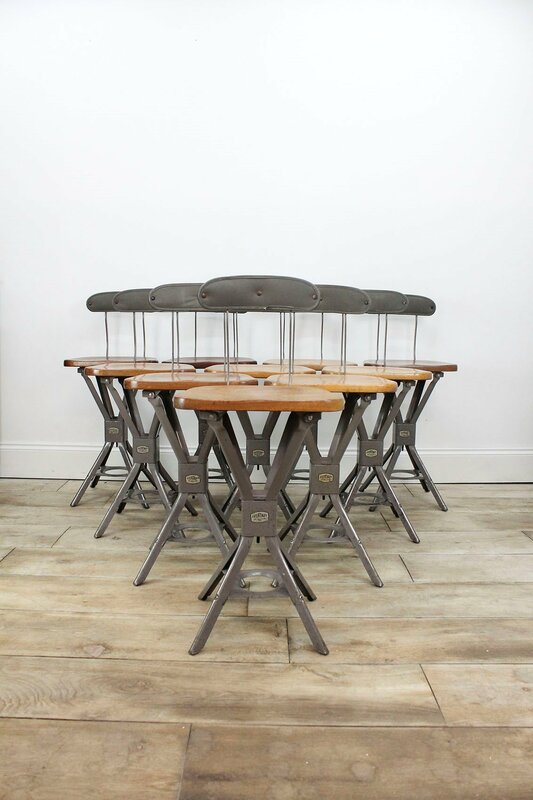 The beauty of these Industrial Evertaut Factory Chairs is simply that there is 19 of them! Great individual pieces but as you can see from the image above, mighty fine as a collective. 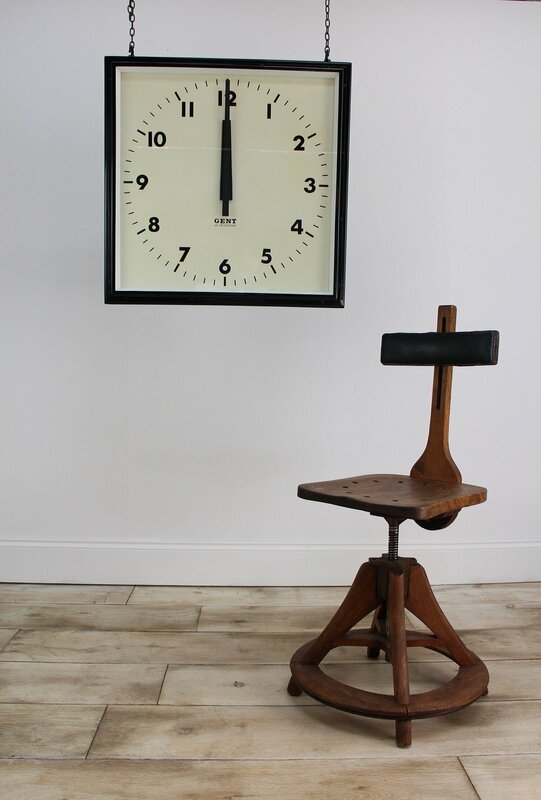 A significant demonstration of British Industrial manufactured furniture – ergonomically designed for comfort, specifically for factory workers to operating machinery for prolonged periods. A very large Antique Ministry of Defence Wicker Trolley. 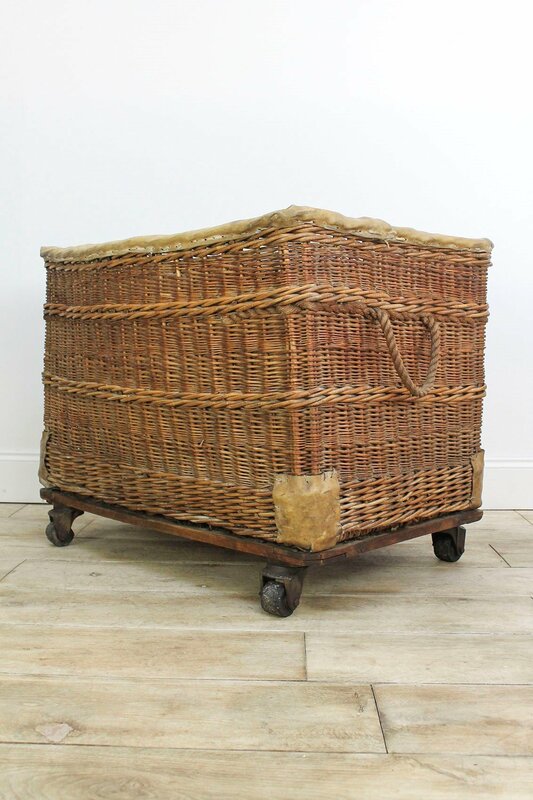 This impressive wicker MOD basket trolley was used to store newly manufactured uniforms. 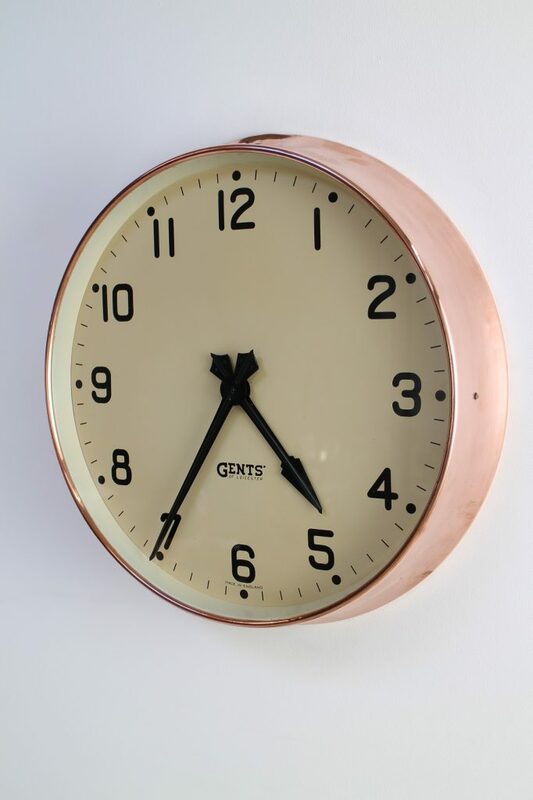 A simply wonderful piece with a charming British history, in a well preserved state with a warm charismatic colour. 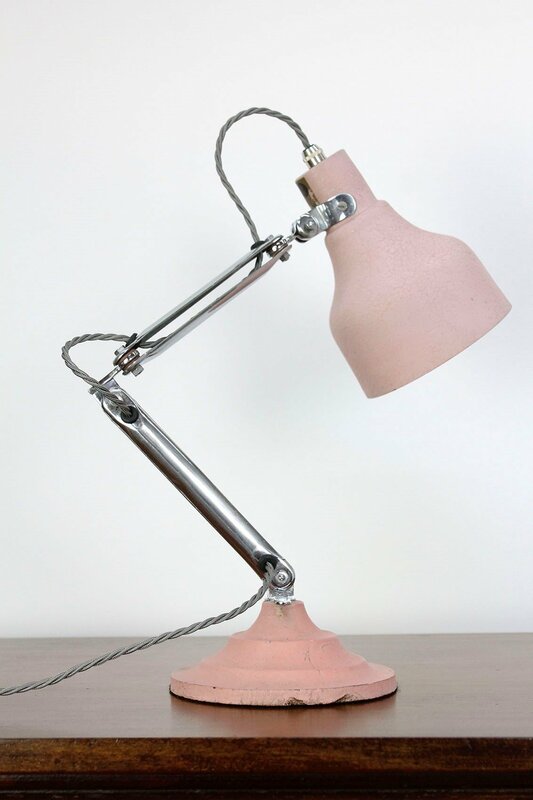 What can we say, it’s a Pifco Anglepoise Desk Lamp, but it’s no ordinary Pifco desk lamp, its PINK! As rare as you like, as original as they come. 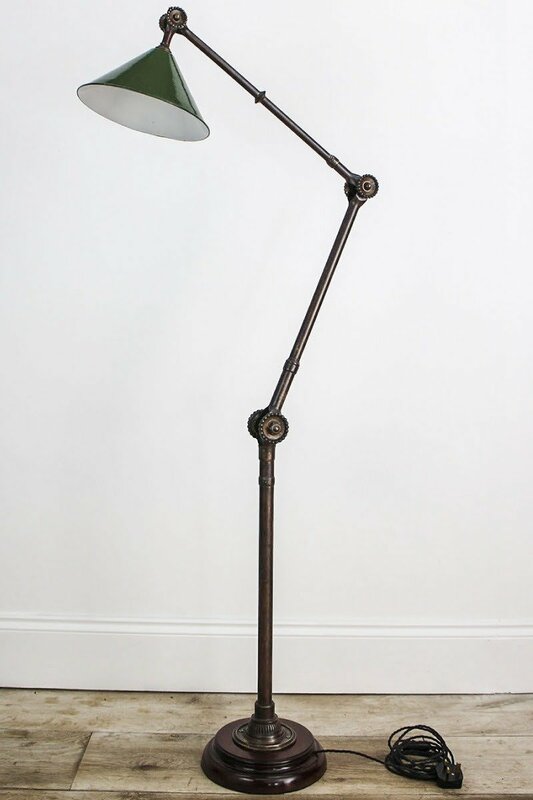 The crinkled pink paint is set on a three step cast iron base with chrome arms – this piece, we challenge you not to love! 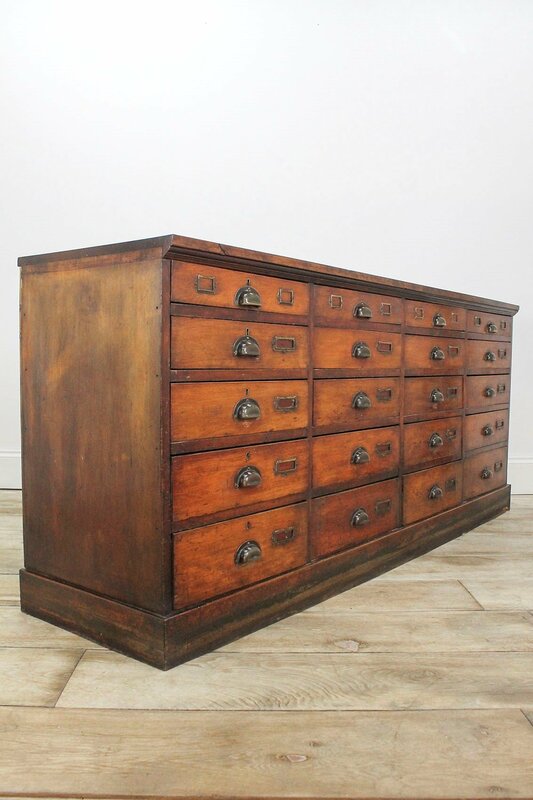 A beautiful sleeping treasure that is an Antique 20 Drawer Jewellers Cabinet, with well-drawn proportions & fine patina. Simply an incredible piece with such eye-catching scale, it would be a focus piece for any room. Not entirely an industrial piece, but these drawers lend themselves to this styling & add creative direction. 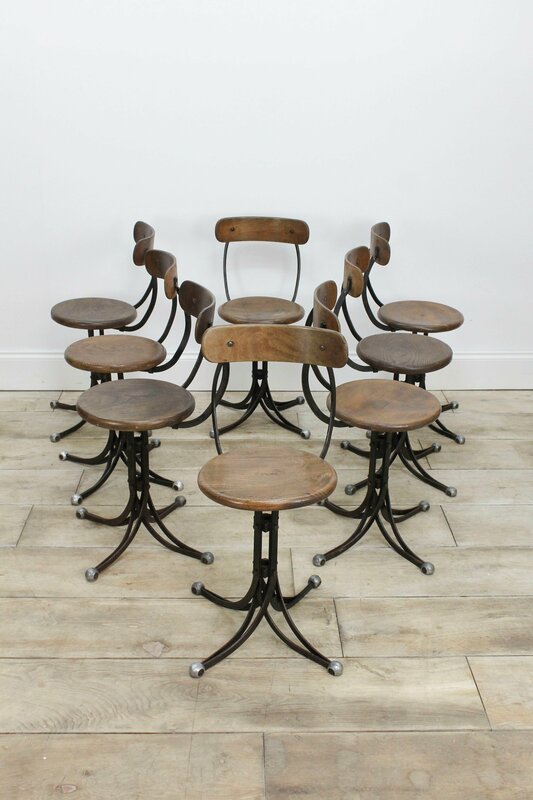 To complete our collection of industrial led furniture, we have 8 Rubery Owen Blade Chairs. 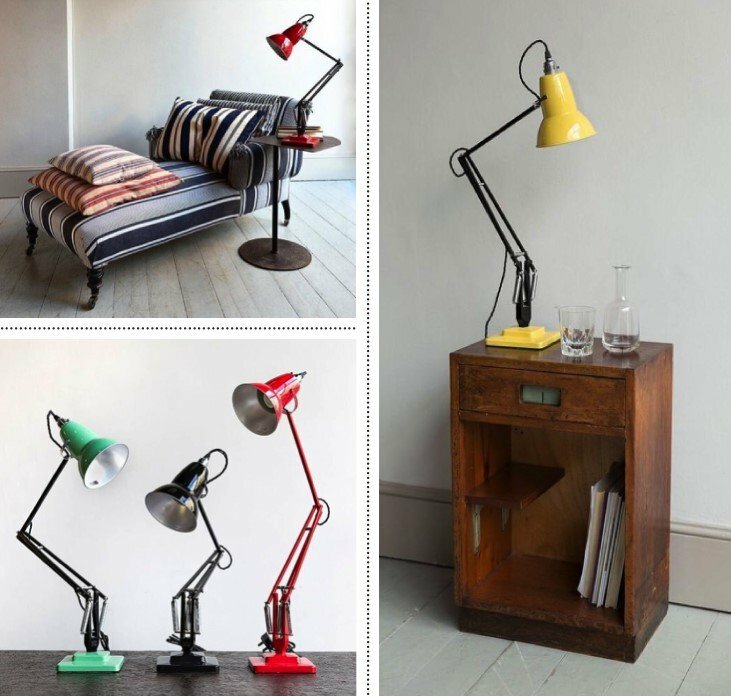 The set are complimentary of their collective form in terms of character & wear. 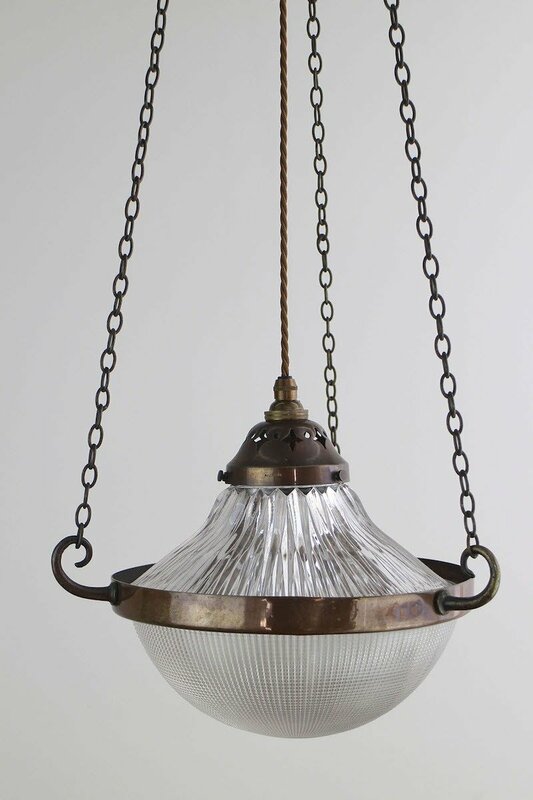 Such a rare find that would create a beautiful seating arrangement for any dining space. 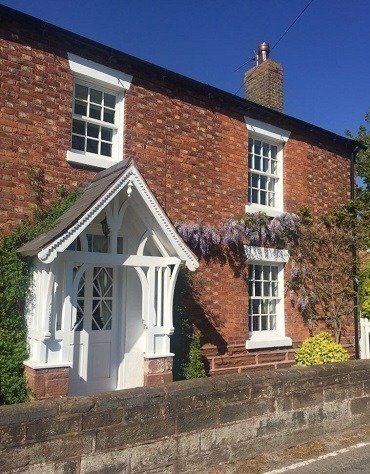 Here at Cooling & Cooling we can appreciate that some buildings adapt well to Industrial styling due to their manufacturing or trade led background. However with a little creativity & the evolution of adapting multiples trends that coherently complement one another, here we demonstrate how to inject this into everyday living. The transition to Autumn is an all-time favourite seasonal switch at Cooling & Cooling – the colour change of the leaves, the beginning of the slightly cooler weather, the layers and the start of hibernation, making a house a home again in anticipation of those moments of calm and hygge. Which leads me to the introduction of our first newsletter, with perfectly apt timing as we start to think about our interiors again & cosying on down in front of the fire with our copies of Living etc for inspiration & Cooling & Cooling at hand making those room editorials seem one step more achievable. 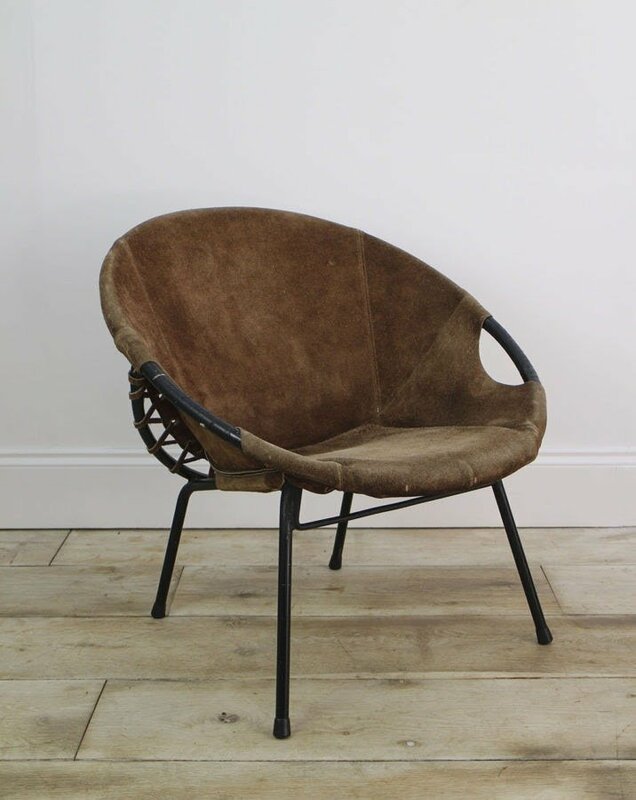 At Cooling & Cooling we are seeing some huge interest around mid-century chairs & Scandinavian hoop chairs. 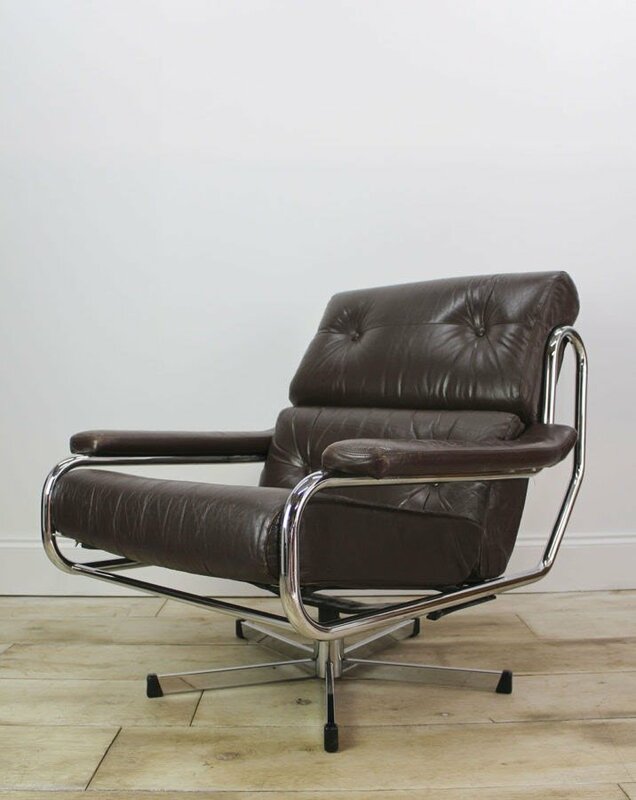 After the success of a similar seating items of this era, we have sought out more of the same but in keeping with the season we have managed to find some delightful brown leathers & suedes…. 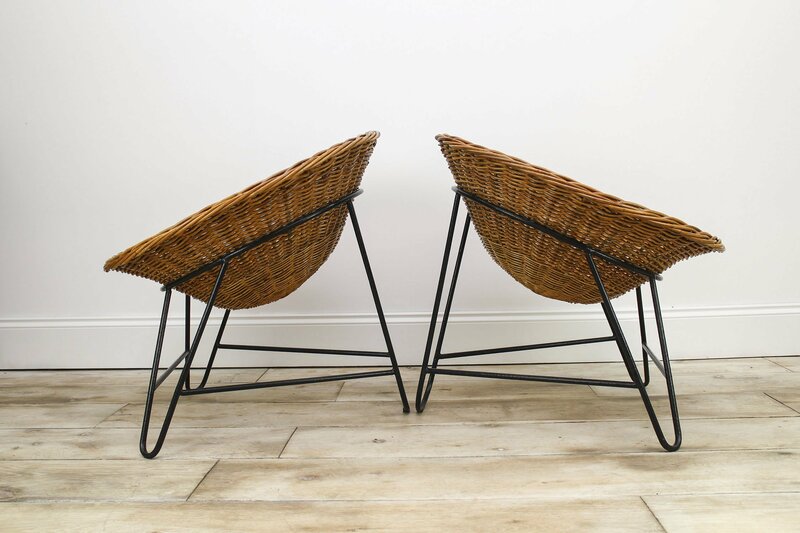 Bamboo is a multi functional & eco friendly material which has been creeping out of the woodworks (excuse the pun!) for sometime. 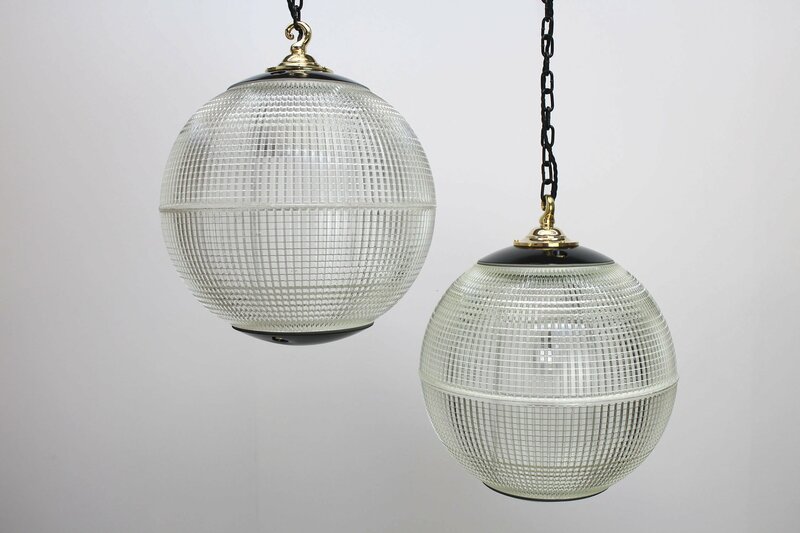 These materials are great in single accents within a room, which gives a subtle nod to vintage and mid-century furnishing. It extends from seating to coffee tables, even traditional room dividers & headboards. 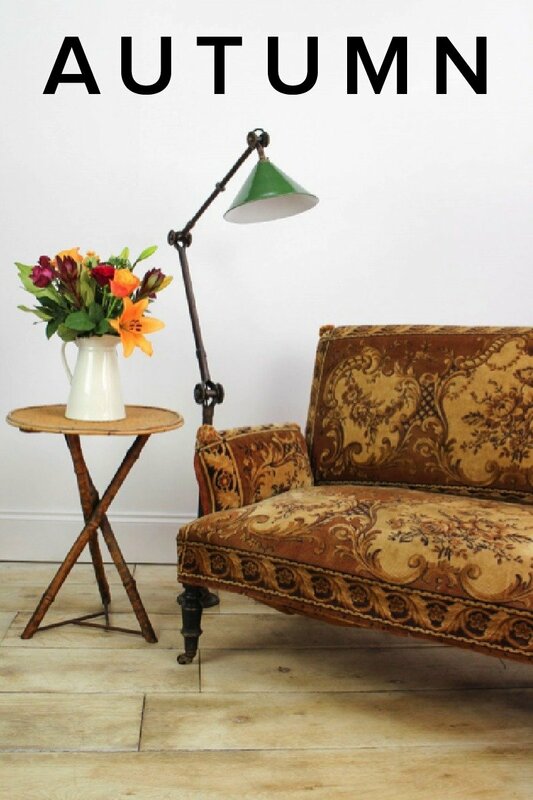 We hope you feel invigorated & inspired, ready to inject some Autumnal Interiors into your life & home. We’d love to hear from you, whether it be a stock enquiry, or simply to tell us your thoughts on our newsletter & what you would like to see more of? 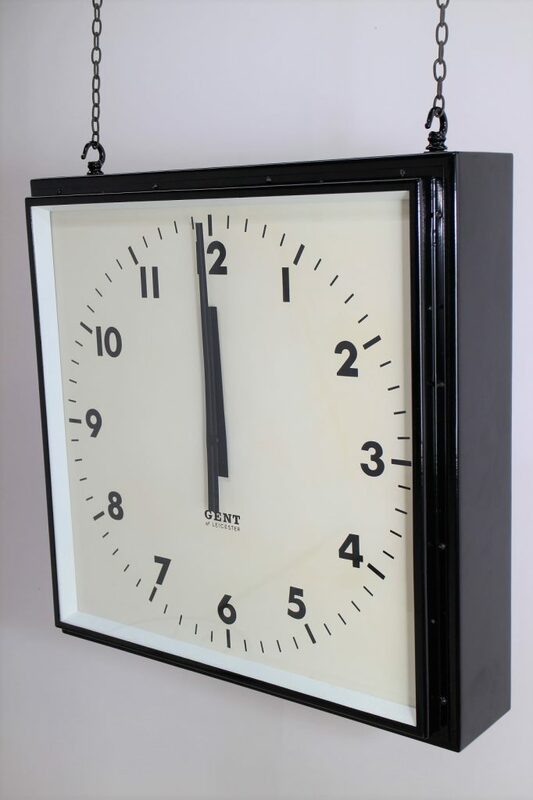 To give you some background & history on our stock, we found ourselves acquainted with a retired senior producer from the BBC, who had hung onto these clocks after the BBC relocated its Manchester Broadcasting Studio’s. 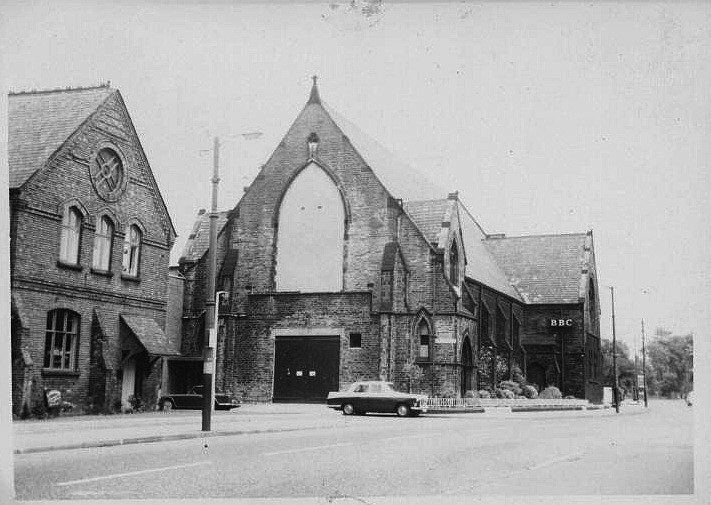 These are originally salvaged first hand from Dickenson Road Studios, the first Northern based building the BBC acquired from Mancunian Films in 1954. 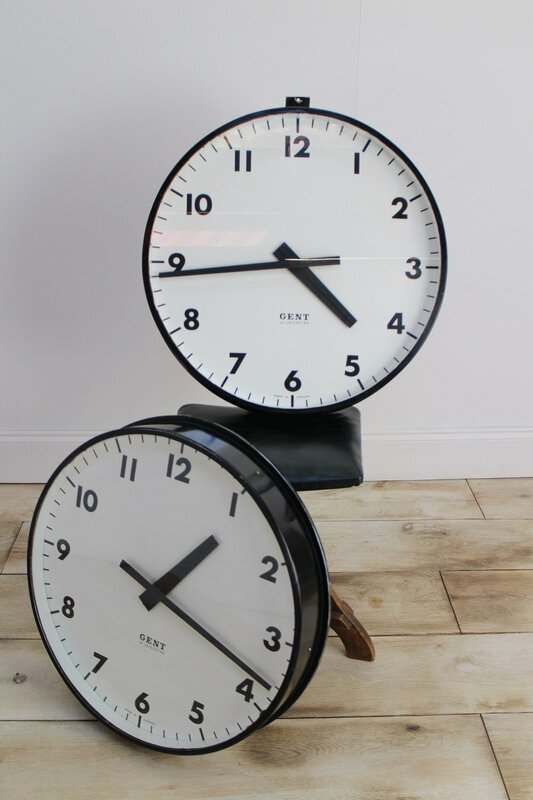 2 x Bakelite 12” Factory clocks & 8 x small 9” circular Bakelite clocks, as pictured in our editorial image. 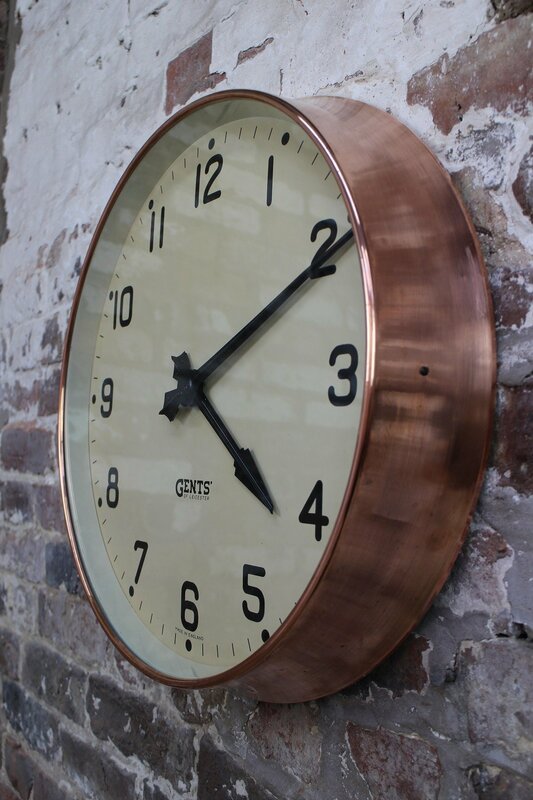 The impact they have together is just incredible & will make a striking wall display using different diameters. 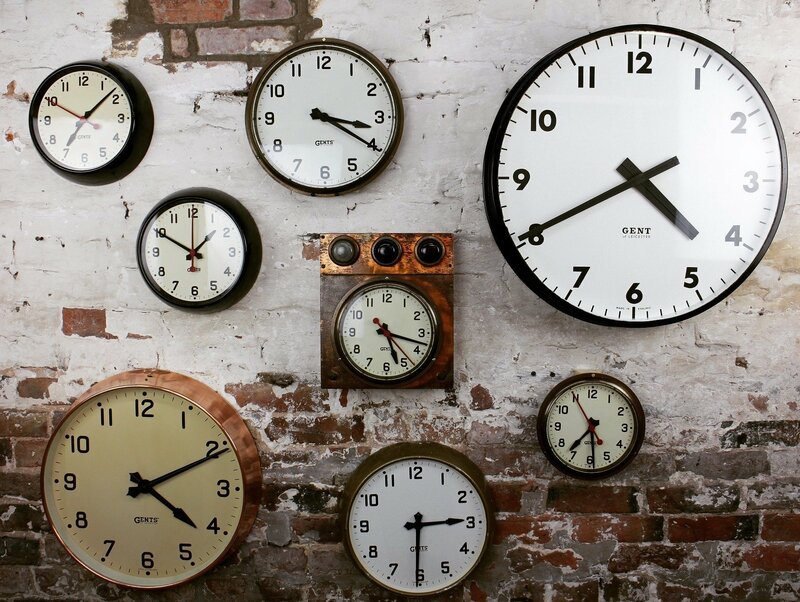 However, you may just need a single large clock for a dramatic presence on a wall feature, these authentic pieces can accommodate any interior environment, be it corporate, residential or an independent business looking to create individual surroundings! 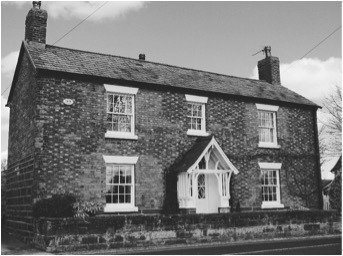 To put into words the last couple of weeks, they have been ‘excitingly chaotic’ as we prepared for the launch of the website! 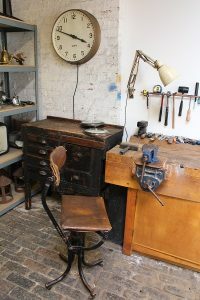 We have been busy finalising the layout & design, alongside restoring & photographing pieces in the workshop to make sure our stock is ready. Cooling & Cooling finally launched on Friday which was a momentous day for Adam & I. The week leading up to the launch our excitement levels were high in anticipation of sharing our hard work, but at the same time we were quite anxious. All our inspirations, idea’s & planning were finally no longer a pipe dream but somewhat a reality, a reality we have now brought to you with so much hard work, dedication and endless emotion! 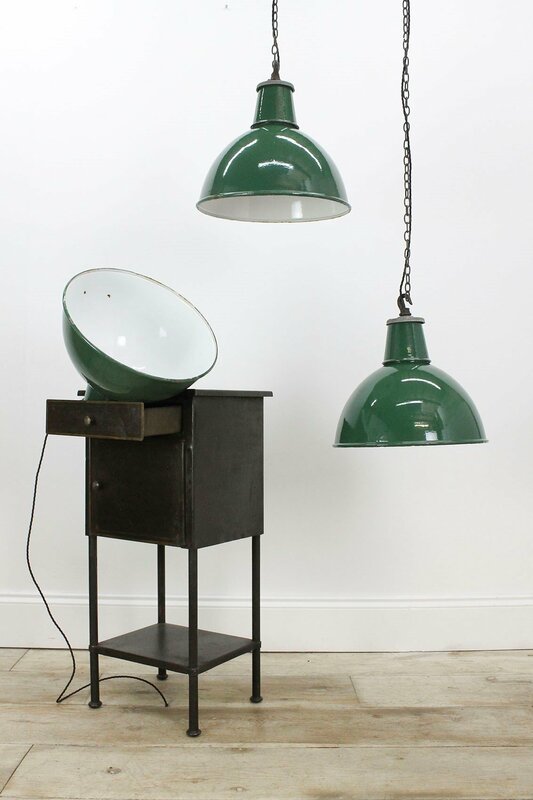 As you can see, at the point of receiving our unrestored individually sourced pieces, they are given some much needed attention in our workshop & then photographed in our onsite studio. 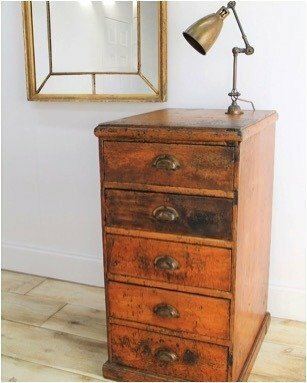 We take pride in the way we present & photograph our pieces, as ultimately we believe that restored furniture has to be situated into the right environment in order to stand out. With that in mind we hope our photography helps you creatively draw inspiration for your own home. A warm welcome to the new site! 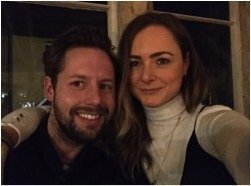 As the site itself is a new venture we thought we’d take the opportunity to tell you all a little more about us… We are a husband & wife team, who have collaborated together after our fixation with rare & unique restored pieces. Our home has been our building blocks, we buy what we like but we both have tendencies to lean towards certain items, yet somehow managing to meet in the middle allows us to curate a well balanced and eclectic offering. 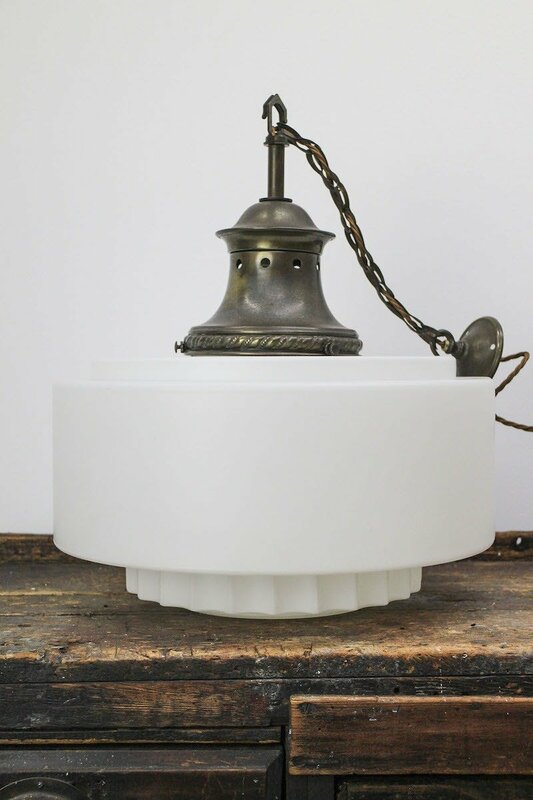 We hope to bring to you the pieces that challenge you creatively & ultimately demonstrate how to style your home with an unusual items, yet in keeping not only with modern day but sympathetic & complimentary to the property. Our objective is to recreate interiors that make you feel nostalgic, yet not out dated, because they are incorporated into room concepts that present stylish & edgy surroundings. We source pieces that are interesting, have historic or restorative value and we hunt in multiples, the bigger the find, the greater the treasure! 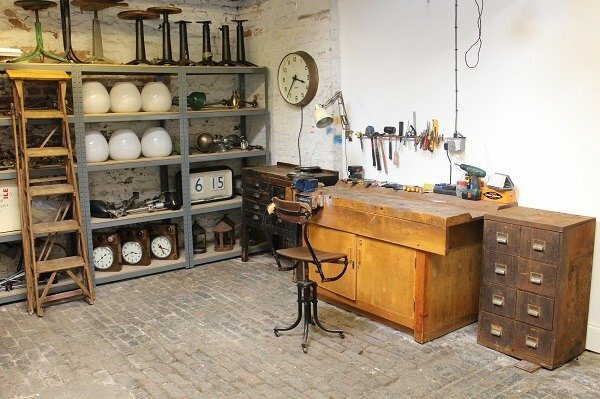 To fill you in further, our services extend are far as you wish…we can source specific items that you require with our continued presence at the countries leading antiques fairs, alongside our explorative adventures further afield, or we can present to you ideas of pieces that we have & believe will suit your surroundings. 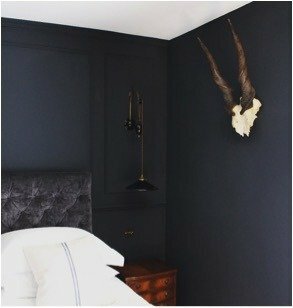 We are able to offer interior advice & support when your creativity becomes too consuming or time is too precious, as we all know it can be! 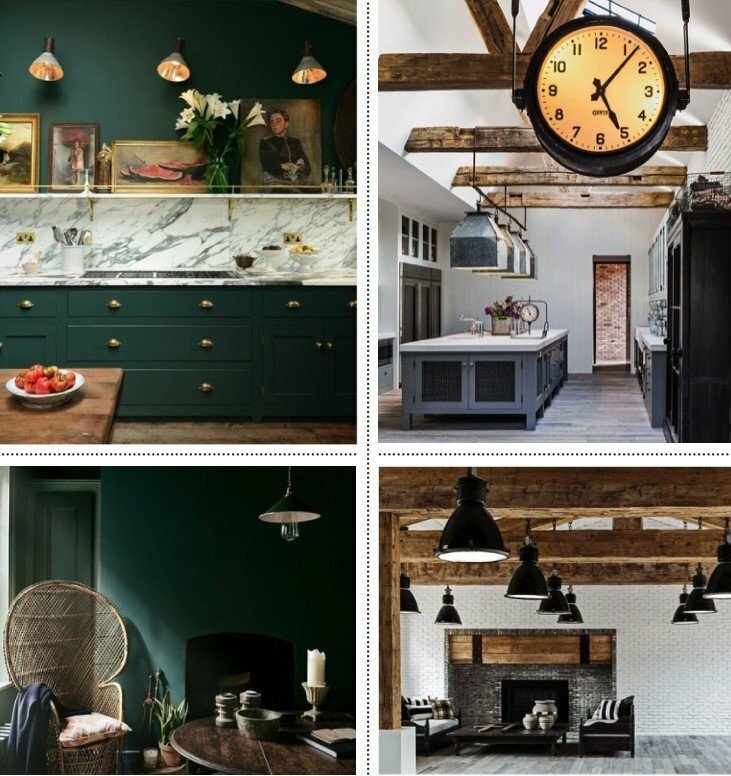 After completely renovating & re-designing each room in our own home, alongside projects of those around us, we can inspire you with collating room concepts, from paint to furniture, including those thought provoking decorative items. 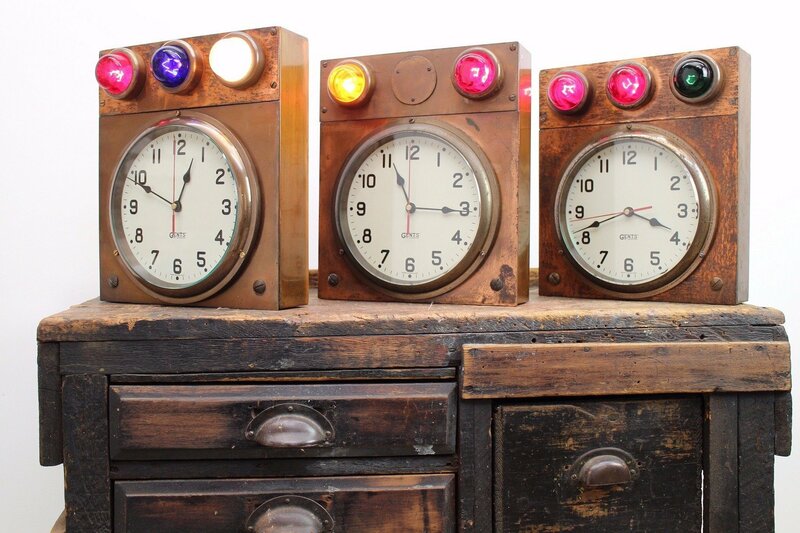 We hope to meet your expectations & further more inspire you to enquire regarding our stock.